The conversation went on for some time, but Yiannopoulos was not really able to engage beyond flippant dismissal. ‘I give up’, he eventually concluded. I was met with a barrage of tweets from disgruntled tweeters (mainly white men), who even went as far as calling me racist, for implying that non-white people were not talented enough to win jobs on merit. This is clearly not what I was arguing, but that is the narrative that followed as my Twitter timeline exploded. The argument presented by Yiannopulos and his loyal band of followers was, however, inherently flawed. The underlying assumption of their argument was that we live in a meritocracy whereby hard work and talent is rewarded. When looking at the facts and statistics, which are now readily available, this premise in turn means that they are subtly saying that people of colour are inherently untalented and undeserving of top jobs. The facts, in which Yiannopulos so strongly believes, do not lie. A report in 2012, for instance, highlighted how 94% of journalists in the UK are white. The implication is that non-whites just aren’t talented or meritorious enough. This is despite the fact that many candidates have degrees from world-class universities and incredible experience, yet are routinely overlooked. The UK Census in 2012 found that 14% of the population was non-white, yet in the same year BAME representation in the creative industries was just 5.4%. It’s difficult to ignore the glaring diversity problem that the UK media has. Only one of the national editors of a UK paper is non-white – Amol Rajan at the Independent, whose appointment was the exception rather than the rule. 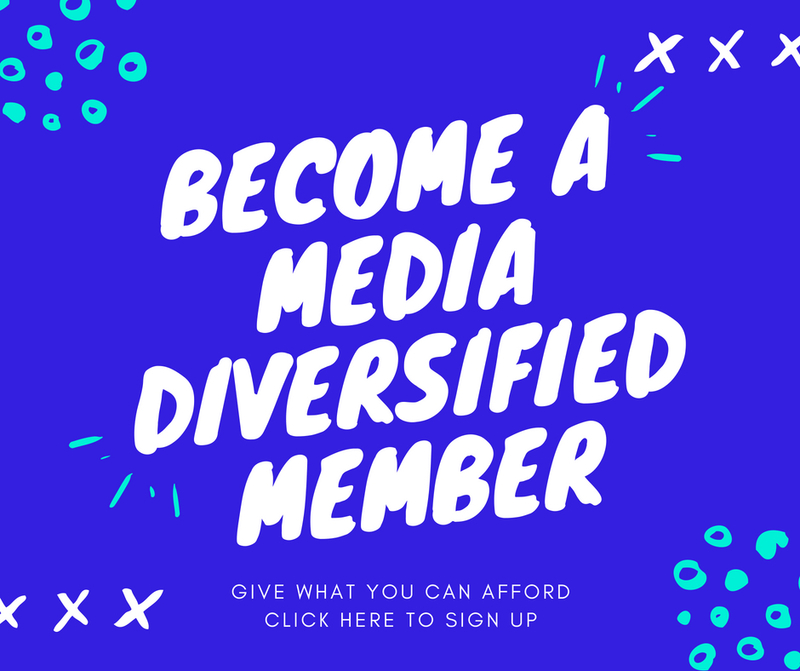 These are the reasons why Media Diversified launched its Experts Directory in March. It’s not just about people of colour. The above graphic from Counting Women is a clear example of this phenomenon from the gender perspective. Women are grossly under-represented in the UK. The advocates for meritocracy again are ultimately suggesting that like people of colour, women lack ability and aren’t hardworking. The statistics are damning and by the logic of those arguing that we live in a meritocracy, it is implied that white men are the most intelligent and hard-working members of our society! The notion that we live in a world where hard work is rewarded is a dangerous one. It makes people believe that those in power, or those who are rich, are there because they are better than the rest. It does not take into account, for instance, the fact that David Cameron came from an incredibly wealthy family who were able to send him to Eton, which in turn gave him a far better chance of getting into Oxford to study Philosophy, Politics and Economics (PPE), which is a course known for churning out generations of politicians. It does not consider the fact that Cameron’s elite upbringing played a huge role in him becoming the Prime Minister, as did family connections on both his and his wife’s side. Class privilege, and the power it confers, is often conveniently misunderstood by its beneficiaries as the product of their own genius rather than generations of advantage, stoutly defended and faithfully bequeathed. Evidence of such advantages is not freely available. It is not in the powerful’s interest for the rest of us to know how their influence is attained or exercised. As a society we simply have to deconstruct this false view of a meritocracy, which is there in many ways to take attention away from the fact that people in power (who most often happen to be white men) are there largely because of their connections and affluence, not because of their superior intellect, hard work and natural talent. This view is incredibly dangerous and is utilized by those who are in power to help erase the fact that we live in a grossly unjust society which relies on a hierarchy of inequality to function. The very nature of the fact that the Royal family lives on benefits flies in the face of the so-called meritocratic Britain. What we have instead are people who are essentially told that the reason why they are doing well is because they are not smart enough. Who look up to these white men in suits who dominate our society as pioneers and leaders. They are not. We need to debunk the myth of the hard-working, intelligent leaders who are only there because they are better than the rest of us. In the American context, the idea of ‘the American dream’ convinces people that they can make it to the top if they work hard. However, this paradigm prevents them from examining structural issues that are designed to prevent them rising through the ranks. It’s no surprise to learn that six of the ten wealthiest Americans are heirs to prominent fortunes, rather than having worked from the bottom up. This phenomenon plays itself out on all levels. In job searches, those who are not white, or not men, might be rejected by ‘colourblind’ employers for other far more subtle reasons, such as the fact that they do not fit in, or don’t seem like the right kind of candidate: reasons that they would say are not down to race. But ultimately they are related to race, even if proponents of the meritocracy myth like Yiannopulos do not realise it. The system is so good that Yiannopulos and his followers can staunchly deny that they are racist, because they cannot see it. To claim that we live in a meritocratic society is simply absurd. All of the statistics on inclusion and participation show this, as does huge income inequality that underpins our society. The logical conclusion of the ‘meritocracy’ myth is that the only talented and productive members of society are all, conveniently and merely coincidentally, white men. meritocracy, n. – societal organisation in which the holders of wealth and power insist that they earned their inheritance and privilege entirely through their own efforts and talents, and that the evidence of those efforts and talents is their wealth and power. The false idea of a living meritocracy reminds me of the capitalists’ explanation of ‘free’ market economics; that individuals all make rational decisions so empowering the invisible hand that moves markets to everyone’s advantage – not that Adam Smith believed it – he stated such an idea would only work within a specified moral framework in which the poor man was more adequately rewarded and not exploited. Merit, like atomistic capitalism, is endowed by the powerful and not recognised as a quality unless there is profit in it. “Meritocracy” is based on completely false premises. There is not one best person for a job and even if there were, we would not be able to find out. When 300 people send out a resumee for 1 job, this does not mean that there are 299 people who cannot do the job and 1 person who can. It usually means that there are 280 people who qualify 100% for that job and maybe 20 people who aimed high. What’s the meassure to find out “who’s best”? We don’T have a Holodeck where you could simulate that job for 4 weeks and let 50 candidates prove themselves simultaneously. Cordelia Fine describes a very interesting experiment in “Delusions of Gender” that shows how bad those “unbiased” decisions actually are. They sent out two different resumees for the same job. One person had more formal education but less experience, while the other had more experience but less education. For half of the subjects the person with experience was male, the person with education female. For the other half it was the other way round. The man got much better feedback than the woman, no matter the qualifications: If she was experienced, it was education they were looking for, if she had education they really needed somebody with experience. In their own minds, those people did not discriminate against the woman. They hired the best person for the job. I doubt that there would be very different results if the paper-people had been a person of colour and a white person instead of female and male. Of course, when you get down to it, the basis of the belief in meritocracy is simply white male supremacy: Life is fair, the best person gets the job and if those are overwhelmingly white guys it objectively proves that white guys are better than everybody else. Blaming white men for the woes of women and minorities is ridiculous. It’s the same logic that the Germans used against the Jews in the 1930’s. You should go and read up about it instead of writing articles that demean yourself and insult people on the grounds on gender and colour. “Blaming white men for the woes of women and minorities is ridiculous”. Yes 2,000 years of Christianity in Britain and legislation designed to keep women as chattels for centuries has had nothing to do with white men whatsoever. At. All. A ridiculous suggestion indeed. So the fact that patriarchy is universal and always has been (and always will be) -pre christian and non christan regions and religions have it as well and it’s whose fault then? Blaming people is not going to be a solution even though that’s what the culture studies department of the modern education system tells you it is.